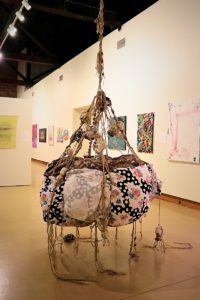 WMA asked several of the 41 artists whose work is currently on display in B18: Wiregrass Biennial to answer questions about their artistic practice. Get to know them better during the next few posts here on the #wmaINSPIRED blog. WMA: Tell us about your work in B18. Both pieces in B18 were originally made as part of a series called In the Hall of the Mountain King, after the famed Edvard Grieg composition based on Henrik Ibsen’s play, Peer Gynt. The play tells the story of a young man who’s super full of himself and ends up making the king of the trolls angry by messing around with his daughter. My mother’s father was in the army, and she spent part of her childhood in Denmark. The fairy tales of trolls made their way from her childhood to mine. I love that the troll can be a source of comfort or terror, maybe simultaneously. The troll was one of the first pieces I made in the series. It’s based loosely on a little leather toy troll that my mom got in Denmark as a child, that I also played with. The larger “tire swing” piece I actually constructed partially in my parents’ basement in Wetumpka, Alabama, while my father was recovering from a surgery—it’s the only piece that was constructed outside of my studio. It worked out really nicely, because they had some rafters that were perfect for hanging the piece from, and I got to talk to my mom about the macramé while I was doing it. She used to do a lot of macramé in the 70s, which is what sparked my interest in it, but she had no memory of how to do it. Luckily, there’s YouTube for that kind of thing! WMA: What is your experience working with WMA? Have you shown work at the museum before? How did you hear about the exhibition? I was in the B16 Biennial. A friend sent me an email with a link to the call for entry and encouraged me to apply. I was thrilled to get in, and even won the Judge’s Prize for my B16 piece — which was also an installation that involved a soft-sculpture troll. I’ve been keeping up with many of the folks I met at the B16 via social media and was excited to have the opportunity to work with the museum again and meet a whole new crop of artists from all over the Southeast at the B18 opening. The WMA really anchors a special community and I love being a part of it. WMA: Do you often participate in juried group shows like the B18? Why or why not? I do. Part of the art process for me is sharing the work; I love to communicate visually and see how different viewers interpret the pieces that I send out into the world. Juried shows are a great way to make new connections with other artists and art lovers. WMA: How long have you been making art? Did you grow up in a school system with a strong arts program? Did someone in particular encourage you to develop your practice? I’ve been making art for as long as I can remember. I have strong memories of my great-grandmother making oil paintings when I was very young — like maybe 2 or 3 years old. The smell of the paint and the way she could make the fruit appear out of nowhere — it seemed like magic to me. She didn’t actively teach me, and I don’t remember being particularly encouraged by one person, although in general I do remember that drawing was a way for me to get attention in a big family. I didn’t have much exposure to art in school. I played violin starting in the third grade, and so rarely got to do art because we had to choose between art and music. WMA: In your opinion, why is it important for communities (both large and small) to have a thriving arts community? Have you chosen to move to a town because of its support of the arts/artists? I moved to New York City solely because of its reputation as a place for artists and spent almost a decade there — but not a continuous decade. I bounced back and forth between Brooklyn and Athens, Georgia (where I live now) a few times. 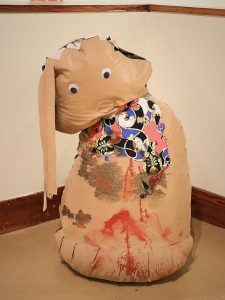 I always felt very disconnected from the art world and like I was missing the zeitgeist when I was out of NYC. But it was hard for me to make art there; I got the most work done when I was in Athens. That pretty much changed with the internet. Now I feel like I can still keep track of what’s happening elsewhere, without paying the high rent for studio space. I’ve noticed a lot of other artists moving back home after school or choosing to stay in their hometowns rather than moving to New York, Chicago or LA. There seems to be a sort of critical mass happening now, with the art world becoming more decentralized—which I see as something that benefits both artists and their communities. Towns like Dothan and Athens can offer a lot to artists in terms of space and time. In turn, artists bring their talents and interests to these towns, changing much more than visuals. It’s not just about beautification or entertainment — politics, city planning, local economies, and education are all interconnected to the arts. WMA: Where do you find inspiration? What (Who) has the most influence on the art you make? I always quote the artist Chuck Close when it comes to this topic: “Inspiration is for amateurs—the rest of us just show up and get to work.” It’s really important for me to keep a work schedule in the studio. As long as I’m in there working, things happen. Of course, I have ideas outside of the studio—I love driving and have some of my best art-related revelations on my commute—but the ideas only materialize when I’ve already got some ongoing studio process that I’m responding to. I’m a professor, so there’s also a lot of research and reading—mostly recent art criticism and artists’ biographies/interviews. And my students keep me on my toes thinking about my own art in relation to their questions and their processes. I also go to as many exhibitions as I can in person (mostly in Atlanta) and I regularly do studio visits with other artists. And of course, there’s Instagram.